When does a picture generate far more than a thousand words? When it is a photo of two young women representing two different Middle Eastern nations. And one of those nations is Israel. 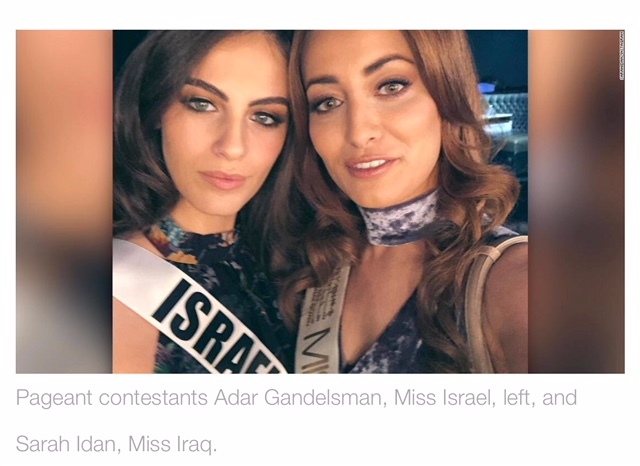 Ask Sarah Idan, Miss Iraq, and Adar Gandelsman, Miss Israel. The two Miss Universe contestants, representing two countries with no diplomatic ties and a difficult history, took a selfie together before the pageant competition this November in Las Vegas — in which Iraq was competing for the first time in 45 years. Each young woman posted the photo on Instagram. And now what began as a Vegas quick pic has become anything but fleeting, as Idan faces online criticism and real-life physical threats, which she says have led her family in Iraq to flee the country for their safety. When the online world crosses into real life, a photo can often have lasting consequences. And when global politics reaches the ground level, the personal act no longer exists. Two young women become vessels for bigger messages and broader conversations. Whether they choose to be or not. “The aim of the photo was an expression of hope for world peace,” Idan wrote on Instagram after a social media furor erupted in reaction to the selfie. We tend to talk about geopolitics in sweeping statements, stripped of the complexity possessed by individual lives. We deploy grand adjectives that describe nameless, faceless people engaged in nameless, faceless acts. But all politics is personal. And in the era of the selfie, the personal goes global in an instant, puncturing the impersonality of headlines. Along the way it also can generate an international uproar, offer a venue for political statements and capture worldwide attention. Two young people from the same region don’t get to be two young people taking a picture at an international event; they are compelled to stand for causes and peoples larger, greater and more subject to others’ interpretation than any one person can be. Idan’s message of peace could be seen as political on multiple levels. Idan, who grew up in Iraq but now lives in the United States, was already making history entering the competition in the first place. She offered the world a striking image of a nation that has endured so much bloodshed and destruction in the past decade, a country so many outside its borders know only for its pain and loss. It’s also a country many who know it recognize for the resilience and strength of its citizens. Spend even a moment in Iraq and you will see the courage its mothers and fathers possess as they try to shepherd families through conflict and upheaval. And yet now Idan is a symbol of something else: the aspiring singer and songwriter is becoming a Rorschach test for her fellow Iraqi citizens, for an international media which is closely following her story and, most to the point of this piece, for her judges and jury on social media, which continues to weigh in on her decision to take the picture in the first place. Those angry about the photo see her as a traitor to the Palestinian cause. Those who applaud see her as a messenger for peace. Those in the media flocking to share her experience see her as a great story that captures the region’s complexity and contradictions. “It’s an honor to be the first woman woman in over 40 years…representing in miss universe 2017,” Idan wrote in early November in a post for Facebook. But now that joy has given way to fear as an online mob, quick to react and even faster to weigh in, condemns her act. None of this changes the fact that two young people standing up for their fellow citizens don’t get to be just two young people experiencing a spontaneous moment. Crowdsourced judgment comes swiftly and brutally. And, in this case, it creates security threats for a young woman who thought she was just taking a photo. If only peace were as contagious and as quick to spread as the sharing of a selfie.